Midwest Environmental Services knows that small amounts of miscellaneous chemicals, either unused or unusable, can create a hazardous work environment. Chemicals in small quantities can often be difficult disposal projects. Midwest Environmental Services Laboratory Packaging service crews have the experience and expertise to handle these types of projects safely and effectively. 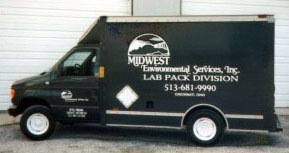 Midwest Environmental Services provides the same economical and environmentally safe disposal services to customers generating “lab pack” quantity wastes. The materials can be handled through our fully permitted facilities or through our established and audited network of disposal and treatment sites. Midwest Environmental Services provides qualified personnel at your location to collect, identify, label, and package the wastes. Our procedures and methods comply fully with all local, State, and Federal regulations. Disposal options include reclamation, fuels blending, thermal destruction, chemical treatment and secure chemical landfill. 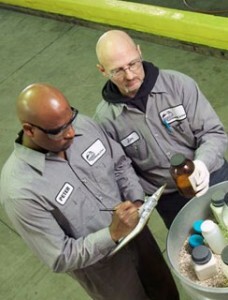 Midwest Environmental Services “lab pack” service is a time-saving and cost-effective option for disposal of unneeded, out-of-date or unknown chemicals that can protect your company from costly and dangerous waste handling mistakes. For additional lab pack information, contact Peter Davis, Technical Manager.